Melbourne lead by 23 points. It has been outscored by 24 points from clearances, but has outscored the Saints 7641 from turnovers. It has also kicked two goals to zero from kick-ins. The Saints are leading the hitoutsto-advantage 17-6. US import Jason Holmes leads the way with nine hitouts-to-advantage. Jack Steven leads the Saints with 29 disposals, eight clearances and eight score involvements. Melbourne has scored four goals from within 15 metres out while the Saints have scored just one behind from within this distance. Melbourne InterchangeDean Kent off due to an injury. Melbourne InterchangeOscar McDonald replaces Neville Jetta and is possibly out for the game. The Saints are hurting themselves by foot, recording 21 clanger kicks so far to Melbourne's 12. Melbourne are also leading the contested mark count 105. It has taken five of the last six contested marks in the game. Melbourne leading the intercept marks 148 across the match. Neville Jetta leads the way with three. Jarryn Geary has nine disposals for the game, but is working hard defensively with a gamehigh 10 tackles across the match. Christian Salem kicks the first ninepoint goal of the game. He is the equal leader on the ground for effective kicks with 10 so far in the game. St Kilda InterchangeMaverick Weller replaces Nick Riewoldt and is possibly out for the game. The Saints have read the ball better from marking contests, winning the crumbing possessions 166. Jeff Garlett leads the Demons with seven disposals here in the third quarter. His efficiency for the quarter in 100 per cent. Sam Fisher leads the Saints for metres gained in the third quarter. He has gained 120 metres from his four disposals. The Saints took the ball from the defensive 50 to the forward 50 in an unbroken chain just once in the first half. They have generated an inside 50 from three of their four defensive 50 chains this quarter. Tom McDonald and Jeff Garlett have both been involved in three of Melbourne's four scores for the quarter. The Saints are only winning the quarter by one point, but have dominated the time in forward half (6337 per cent). Melbourne is using the ball better by foot in the forward half of the ground than the Saints. It has a kicking efficiency of 71 per cent in this zone, 15 per cent higher than the Saints have recorded down their end. Tom Hickey kicks his first goal of the match after taking it straight out of the ruck. He has now launched a gamehigh five score launches for the game. Max Gawn with his fifth hitoutto-advantage which leads to a Garlett goal. He has a team-high three score launches for the game. 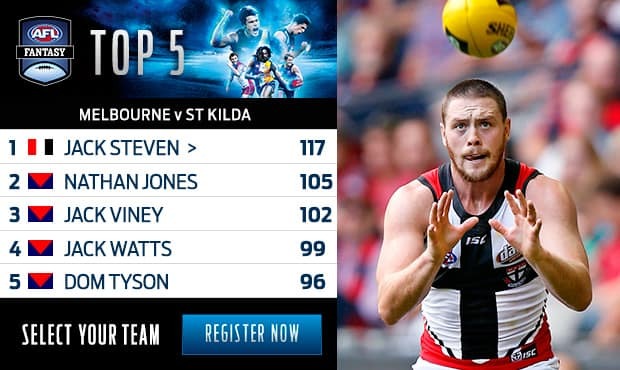 St Kilda has launched five of its six goals from forward half chains. Melbourne on the other hand have scored five of its eight goals from defensive half chains. 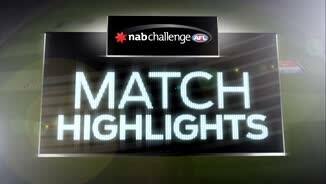 Montagna kicks a goal from just inside 50it is the Saints first score from general play so far in the match. They have kicked 5.3 from marks. Nick Riewoldt is playing in a new role across a wing. He has also had an impact at the stoppages with four thirdman up hitouts. Only one of these has been to a teammates advantage. The Saints are struggling to move the ball from one end to the other. They have had 19 chains starting in their defensive, only one of these has ended in an inside 50. Tom McDonald is Melbourne's leading disposal winner with 11 so far. Four of these have come from intercept possessions. After having the final six inside 50s of the first quarters, Melbourne has had another six in a row early in the second quarter. St Kilda scored 26 of its 29 points from forward half intercepts. Melbourne score just six of its 25 points from this source. Melbourne has had the last six inside 50s of the game. In the last 10 minutes St Kilda has a disposal efficiency of 86 per cent and Melbourne is at just 44 per cent. The Saints have scored six times from Melbourne turnovers in this time. St Kilda has had six forward half intercepts from Melbourne turnovers for a return of 3.1 on the scoreboard. Saints are moving the ball better and more often by hand. Leading the handballreceives 17-6. Seb Ross leads the way with five. St Kilda InterchangeSebastian Ross replaces David Armitage due to the blood rule. Melbourne has two inside 50s for two goals. Josh Bruce kicks the Saints first goal from a contested mark. He took 28 contested marks in the forward 50 last season, ranked equal second across the Home and Away season. St Kilda InterchangeLuke Dunstan replaces David Armitage due to the blood rule. Melbourne ranks No.1 across the NAB Challenge with a contetsed possession differential of 21 per game. It also ranks No.1 with a clearance differential of 9 per game. Jack Viney leads the side in both stats, averaging 15 contested possessions and eight clearances per game, ranked No.1 in the competition in both stats of anyone to play at least two games. Welcome to Etihad Stadium for the Melbourne v St Kilda Round 4 clash. MELBOURNE has gone through the NAB Challenge undefeated after notching a confidence-boosting 24-point victory over St Kilda in a feisty round one tune-up at Etihad Stadium on Sunday. Following tight triumphs over Port Adelaide and the Western Bulldogs, the Dees kept the good times rolling under senior coach-in-waiting Simon Goodwin, fighting to a 1.14.14 (107) to 0.12.11 (83) win. After their second defeat either side of a washout in Mackay, the Saints breathed a sigh of relief with skipper Nick Riewoldt escaping injury in his first game of the pre-season. Riewoldt pulled up short in the fourth quarter and was seen icing his calf on the bench, but coach Alan Richardson dispelled any injury fears, saying the 33-year-old star was simply being managed. "The plan was for him to play 90 minutes … he just got a little bit tight late in the game, just general tightness, so he'll be fine," Richardson said post-match. Riewoldt roamed mostly on a wing and got through his first hit-out by gathering 10 touches before leaving the field. The Saints, fresh from the washout against the Brisbane Lions, burst out of the blocks, but it was the Dees who ran over the top and prevailed in an encouraging sign for their long-suffering fans. Both sets of supporters could take some positives, though, with Josh Bruce, Jack Billings and Jack Lonie forming a threatening forward combination for the Saints despite only limited assistance from Riewoldt. High-flyer Bruce (two goals) showed his breakout year was no fluke while Billings assured everyone his rise to stardom hasn't been slowed by shin stress fractures that ended his 2015 season early. Billings nailed his three majors in the opening term and looks ready to explode in his third season at AFL level. At the other end, Demons livewire Jeff Garlett (three goals) and a creative Jack Watts helped fill the breach after out-of-sorts spearhead Jesse Hogan struggled to make an impact, apart from a booming goal in the final term. Watts booted two goals in the first quarter, his second threading the needle after the siren to slash the margin to just four points, while Tom McDonald was a rock in defence helping the Dees stand firm under an opening barrage. Fielding their full complement of midfielders, the Saints' engine room ran rampant early and Jack Steven, Seb Ross, Leigh Montagna and Luke Dunstan found some good touch. Having weathered St Kilda's storm, the Demons ramped up their pressure, suffocating the Saints' ball movement and getting on top through the tireless work of Nathan Jones, Bernie Vince and Dom Tyson. The Dees hit the front by 10 points at the long break before extending their advantage in the next two quarters, with assistant coach Goodwin praising his side's improving all-round game. "I think there is still plenty to work on but we're really pleased with the style we are starting to develop, and we feel confident in our preparation and where we are at," he said. 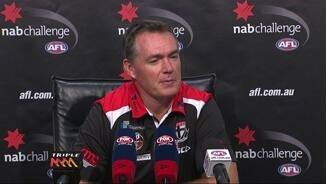 "But there is still lots we can improve on, which I think is exciting for our footy club. "We're trying to move the ball in a different way, there is no doubt, and with that there will come some mistakes. "It's certainly not going to be perfect but the signs are there." Another positive was the continued good form of Melbourne young gun Clayton Oliver, who firmed for a round one spot thanks to another mature performance in his third consecutive game. The No.4 draft pick crashed packs and looks a readymade senior onballer after racking up 18 touches and booting two goals. Souring the win was a concussion suffered by Matt Jones, who played no part after quarter-time, and Cam Pedersen's high bump on Nathan Wright in the final term which will surely attract Match Review Panel scrutiny. Neville Jetta was fortunate to escape injury after rolling his ankle in an incident near the boundary line in the fourth quarter. 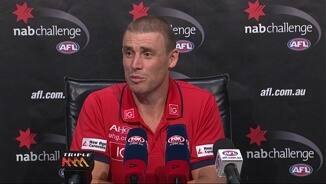 Melbourne: Melbourne fans will have to live with mistakes as the club tries to perfect a more attacking game style. The success of switch kicks deep in defence was variable but when they came off, Melbourne moved the ball efficiently. The Demons have good young bookends in Jesse Hogan (although he made some uncharacteristic errors) and Tom McDonald, Max Gawn and Jack Watts are improving and their youngsters have promise. Jeff Garlett is also the most underrated small forward in the AFL and they should provide Greater Western Sydney with some headaches. St Kilda: The experienced core will be better for the run with Nick Riewoldt, Leigh Montagna, Jarryn Geary and David Armitage improving as the game went on. Jack Billings looks set to take another step this season. He is clean, makes good decisions and can find the goals and Jack Lonie looks a similar type. Tom Hickey needs to improve his ruck work although the Saints are fond of using a third man up around the ground. If Dylan Roberton can clean up his kicking to support the experienced defenders around him the Saints should become harder to score against. 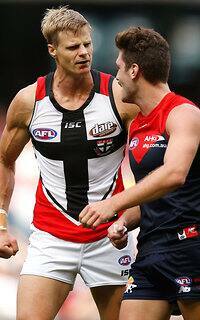 Melbourne: Tom Bugg is an antagonist with the ability to distract opposition players. He was at his annoying best on Sunday but he also has courage and wins the ball. He took a spectacular mark and kicked a goal and looks a certain starter in round one, as does Clayton Oliver after an excellent NAB Challenge series. Ben Kennedy's pre-season has put him in the frame for round one and he contributed in the midfield in the last quarter but he still has plenty of room for improvement. Rookie Josh Wagner struggled deep in defence against St Kilda but the pre-season experience will help his development. Oscar McDonald played two senior games last year and looks set for another development year. St Kilda: Jade Gresham dropped a chest mark in the goalsquare, denying himself a certain goal but he knows how to find space and will only improve. He has a mature enough body to play early. Blake Acres gave away an undisciplined 50m penalty and looks a little shaky on his non-preferred foot but he has courage, is a good size and is balanced so with perseverance he will be handy. Jack Billings looks set for a breakout season while Luke Dunstan is similarly poised. Jason Holmes has a good leap but needs to do more around the ground while Tim Membrey did not have much of an influence. Melbourne faces a tough test against Greater Western Sydney at the MCG on Easter Saturday but the game should give a good indication of Melbourne's improvement. St Kilda goes to Adelaide Oval to take on Port Adelaide on Easter Sunday. It's a big assignment for the Saints, given they missed one NAB Challenge game.